Emotional Intelligence (EQ) is an individual’s capability to recognize one’s own emotions and those of others. In other words, you can identify different feelings and appropriately label them. You then use this knowledge to guide thinking and behavior, such as decision-making. Further, you manage emotions to adapt to environments and relate to others. The BlueEQTM core logic increases EQ to create higher psychological safety. Significantly, this in turn leads to greater career and business impact. We are the only company that has successfully taken this quantitative and measurable approach to emotional intelligence. Moreover, our core logic is systemic throughout our assessments, workshops, coaching and consulting engagements. As a result, it just works. Psychological safety is a shared belief that it’s safe to discuss ideas, experiment, take risks, give feedback, and learn from mistakes. For this reason it fosters higher levels of innovation, creativity, engagement and job satisfaction. BlueEQ’s Assessment enables accurately rating of your leaders’ ability to create a climate of psychological safety for team members; but what exactly is psychological safety? Psychological safety is a workplace climate that allows teammates to take risks, learn from mistakes, give candid feedback, and innovate. When a workplace is not psychological safe, teammates tend to keep ideas to themselves out of fear of ridicule, they don’t give candid feedback, and because they fear for their job, they enter into self-preservation mode. Nevertheless, this is an extremely counter-productive mindset. Everyone has experienced this in one form or another – does it sound familiar to you? When a leader knows some tricks of persuasion but lacks emotional intelligence skills, you’re left with a master-manipulator who does not create psychological safety. What kind of leader are you presently? Take this assessment and find out. Researchers within Google, our own research team, and many others are just realizing how grand the scope is for emotional intelligence skills and why it’s become increasingly important to assess the EQ of leaders and contributors in an organization. It’s a bold statement, but researchers are practically unanimous in finding that emotional intelligence skills are a greater indicator of organizational and personal success than IQ. This of course assumes these individuals possess a minimum baseline IQ. When taking an Emotional Intelligence Assessment, it’s important to know how valid your scores are. For this reason, BlueEQ’s Emotional Intelligence Assessment has by far the highest validation scores in the industry. 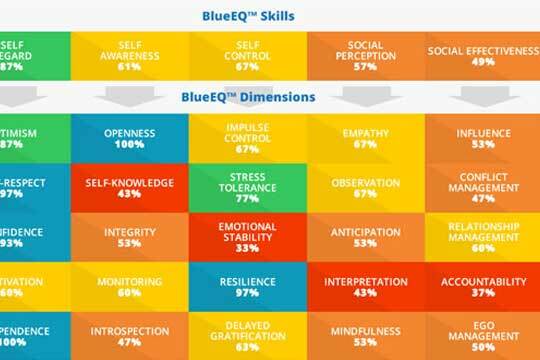 After years of research and testing, the team of researchers at BlueEQ™ created a robust emotional intelligence test consisting of 150 questions that assesses both strengths and weaknesses in 5 Emotional Intelligence Skills and 25 specific EQ dimensions. 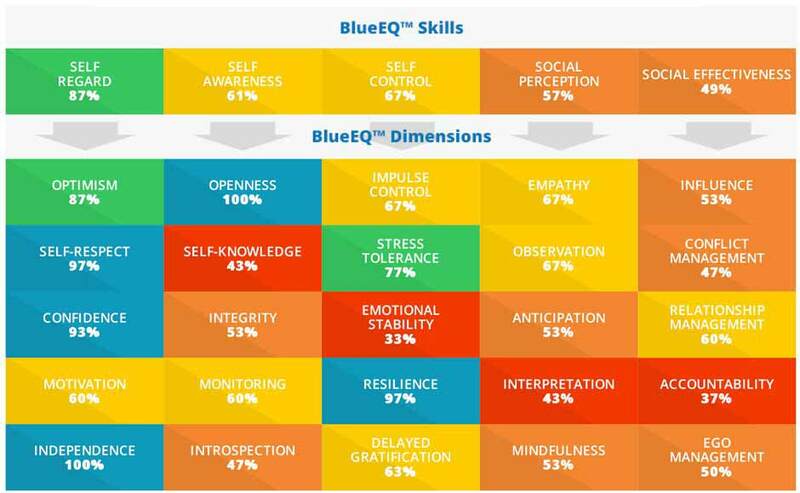 The BlueEQ™ Assessment is a reliable and valid tool that accurately measures emotional intelligence. Further, it provides practical application for personal growth and career development. 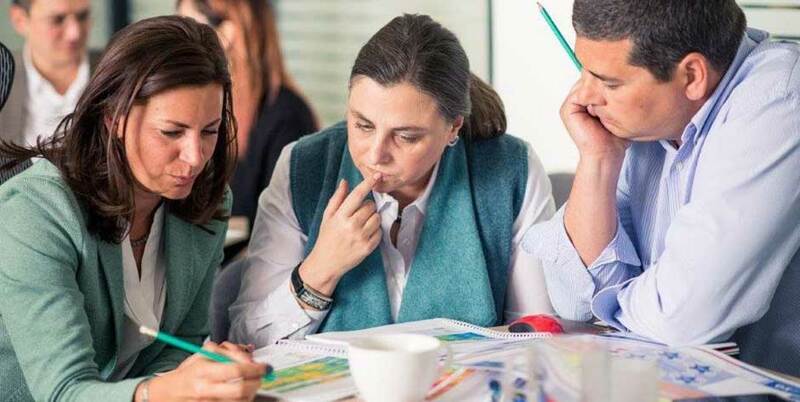 From seasoned professionals to new managers and entry-level employees, everyone benefits from understanding and improving emotional intelligence competencies. There should be a great amount of urgency for all organizations to assess the emotional intelligence of their leaders. After all, it’s the leader of a team that sets the tone for collaboration and productivity. How important of a leadership factor is Emotional Intelligence? Many of us think that charisma or technical proficiency make great leaders. In reality, the research points to EQ as the #1 principle for a leader to enable teammates to fully engage and achieve superior business impact. According to Google’s Aristotle project, the key trait to a successful team is psychological safety, and we’ve found that a leader can only create psychological safety through Emotional Intelligence skills. Increase your organization’s emotional intelligence and learn how to use EQ to accelerate business results by joining us for a public session of the BlueEQTM Texas Mastery Workshop. Specifically, this workshop is designed with rigorous skill-building exercises to increase the 5 EQ skills: Self-awareness, Self-regard, Self-control, Social Perception, and Social Effectiveness. This highly interactive workshop provides executives and managers the tools needed to create a psychologically safe zone within their organization. Help your leadership build a zone of workplace psychological safety which has been found by many studies to increase; creativity, innovation, energy, accuracy, and retention within your organization. How Psychologically Safe is your workplace presently? Correspondingly, how do you measure it? Find out how the Emotional Intelligence of your leaders and contributors can create a psychological safe zone where innovation can flourish. Register for a Webinar today! Emotional intelligence isn’t just a buzzword but a necessary skill for organizations. We invite you to take 45 minutes out of your schedule to participate in this career-changing webinar. Our experts discuss how BlueEQ’s unique approach to emotional intelligence will sky rocket job performance and leadership effectiveness. Take 45 minutes to make a lifelong change. Join one of our upcoming webinars! Revolutionize Your Organization’s Leadership Capabilities in 30-90 Days. Our on-site BlueEQTM Mastery Workshop will increase your organization’s emotional intelligence and accelerate business objectives by enabling participants to feel psychologically safe to innovate, be challenged, and excel. Accordingly, this workshop is designed with rigorous skill-building exercises to increase Self-awareness, Self-regard, Self-control, Social Perception, and Social Effectiveness. The program begins with the best-in-class BlueEQTM Assessment. 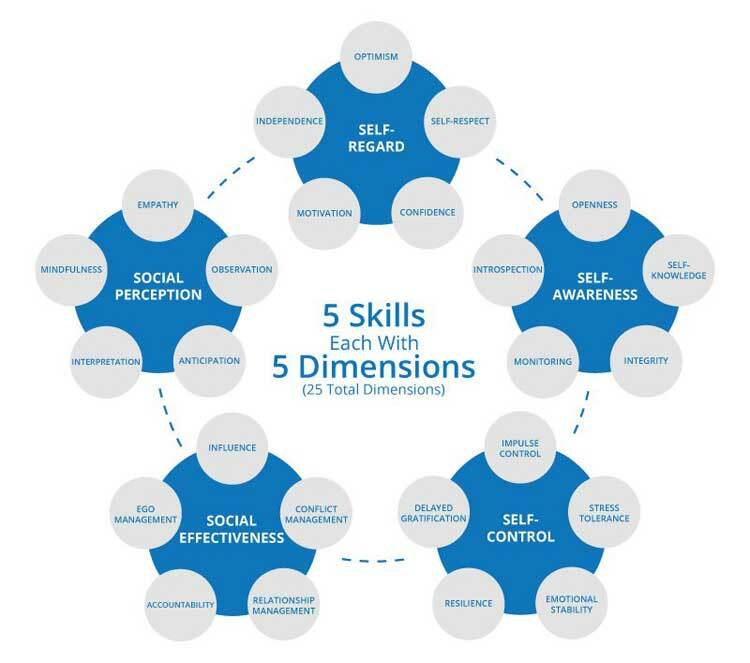 First, it breaks down emotional intelligence into 5 skills and 25 dimensions. Then it targets areas of strength and areas of improvement as an initial baseline. After our interactive trainings, participants will put specific action items into practice during a 30-to-90-day period. Finally, at the end of that period, participants will retest to measure changes in emotional intelligence and behavior. Generally speaking, this is the i4PTM process. Recognize the Emotional Intelligence principles that make employees passionate and engaged. Understand the direct link between Emotional Intelligence and brand lift. Measure your team’s level of psychological safety. With this in mind, research shows that Psychological Safety is the number-one factor in having a successful team. Ultimately, the BlueEQTM Mastery Workshop increases emotional intelligence to create greater psychological safety that fosters innovation, creativity, engagement, and job satisfaction. In brief BlueEQTM includes five skills. Each skill comprises five dimensions. To improve a skill, focus on developing the dimensions within that skill. For each skill and dimension, BlueEQTM generates your score as an average rating for a set of questions. This comprehensive approach allows the participant to identify and isolate behaviors and skills in very specific ways. Once areas of weakness and blind spots are identified, participants can develop a plan of improvement. The BlueEQTM Profile is a 35 page detailed analysis of the participant’s results. Notably, the profile is easy to understand and implement. Below is a sample of the BlueEQTM color map of the results. Participants can easily identify the colors that represent skills and dimensions that are; Risk Factors, Limiting Factors, Growth Factors, Strength Factors, or Success Factors. In one graphic, the participant can quickly identify those areas that will be of the greatest benefit to improve. Each BlueEQTM skill and dimension is broken down into its own profile. The profile clearly identifies the status of the score in a color-coded bar. The profile also includes; a definition of the skill or dimension, the characteristics of high scores and low scores, tips and techniques to improve and why it matters based on the participant. With each BlueEQTM emotional intelligence assessment and workshop participants have access to the i4PTMdevelopment plan. The i4PTM personal development plan helps participants identify the skills and behaviors they wish to improve. This provides a systematic approach to ensure the highest levels of success. Participants are strongly encouraged to include either a peer mentor or a coach to assist them with their plan. Contact us to implement PS16TM in your organization. Psychological Safety is a shared belief that it’s OK to take those reasonable risks required to make the next breakthrough. It’s also a climate where it’s safe to make and be open about mistakes. In the long run, we use that experience to learn and challenge the status quo. 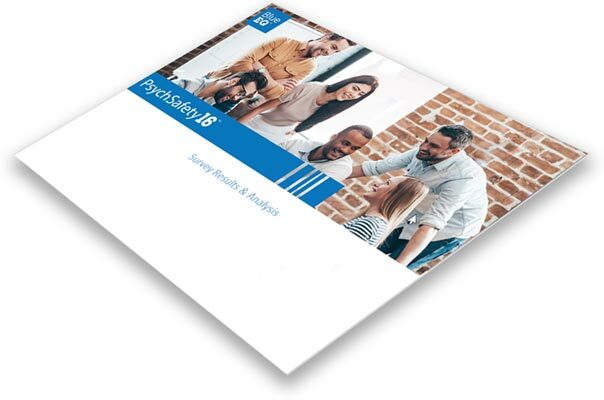 The PS16TM survey consists of 16 items that employees answer. In like manner to a 360-style survey, it’s important that enough team members participate. This is done in order to obtain an accurate snapshot of psychological safety levels in their work zone. All items in the PS16TM survey fall into 4 categories: Learner Safety, Challenger Safety, Collaborator Safety, and Inclusion Safety. The results provide an overview of how well your organization performs in each category. Additionally it breaks down each of the 16 items to get a granular view. Identifying both areas where your organization is strong and where your organization needs improvement. Teams thrive when a climate of Psychological Safety is present, and we call it a Blue Zone. Google’s Aristotle project recently confirmed our research after 2 years of studying 180 of their work teams. All aspects of these teams were closely measured (e.g. technical skills, demographic information, levels of collaboration, etc.). They found that by far, psychological safety was the best indicator of the team’s success at accomplishing their objectives. Leaders and organizations that go without assessing their organization’s psychological safety are living with blind spots. Further, employees that are feeling the pain are not able to speak up about it. Especially when the workplace is not psychologically safe. However, teams can go on like this for years. As a result, it often requires an anonymous survey such as this to identify where problems exist. And even more to convince management to take action. It’s important to remember that Psychological Safety doesn’t simply happen when a leader commits to being a ‘nice person’. A climate of Psychological Safety is a product of a leader’s emotional intelligence skillset. Also, psychological safety is important but isn’t the silver bullet to productivity. As Amy Edmondson at Harvard points out; psychological safety without accountability is a comfort zone, while psychological safety with accountability is a learning zone. Leaders must master the EQ skills that lead to both psychological safety and accountability. For this reason, the BlueEQTM Emotional Intelligence Assessment and PS16TM go hand-in-hand, and we recommend that your executive team assesses their EQ after discovering your psychological safety weak spots.